Beet greens are rich in iron. Do you ever wonder what vitamins are in beets? Beets are a nutritional powerhouse, bursting with vitamins and other vital nutrients. 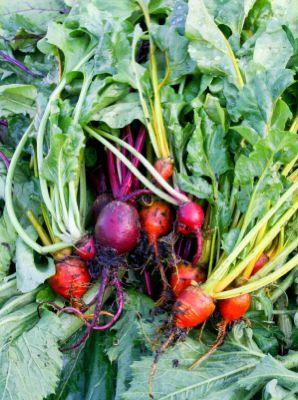 Once prized only for the greens, beets are now enjoyed for the roots as well. Beets are primarily grown as a root crop but are also prized for their tasty greens, reminiscent of their relatives spinach and Swiss Chard. Beets grow quickly and include many varieties in colors ranging from red to yellow to white and even striped. Most beets have a sweet tasting flesh thanks to a high sugar content. Surprisingly, these sweet vegetables are also packed with vitamins and minerals. What vitamins are in beets? Read on to learn more. What Vitamins Are in Beets? Having a list of vitamins is one thing; knowing what they do for you is far more valuable. Vitamin A is a useful antioxidant that is well known for it's ability to reduce wrinkles. It is also essential in the utilization of protein by the body. Beta-carotene has been shown useful in preventing cancer. These are found in the beet greens especially.Vitamin B6 is used in more bodily functions than nearly any other nutrient. In fact, the nervous system requires this vitamin in order to function properly. Folate is often called "brain food" and is recommended as a supplement for all women of child bearing years because it protects babies from birth defects. Vitamin C is needed for the body to utilize folate, among other important functions. Riboflavin, or vitamin B2, is needed for the metabolism of fats, proteins and carbohydrates. Thiamine, or vitamin B1, is important for cardiovascular health. Vitamin K is necessary for cardiovascular health, bone health and other important functions. Magnesium is one mineral that most people are deficient in. This deficiency can lead to heart problems, migraines, high blood pressure and more health issues. Manganese is needed for healthy nerves and immune system. Potassium is also important for your immune system as well as to regulate your heart beat. Iron is important to the oxygenation of the blood. Beets are also rich in anthocyanins. Anthocyanins help to protect and repair the DNA of your body. You'll also get vital antioxidants from eating beets. Additionally, beets are high in fiber, high in complex carbohydrates (the good carbs), low in fat and contain no cholesterol. At only 58 calories per serving, beets are a healthy food to include in any diet. Beets can be enjoyed in many ways. The greens can be boiled like spinach or eaten fresh in a salad. The root are often pickled and eaten cold in salads. They are also enjoyed hot as a side dish. If you have ever eaten Borscht, you know it is a Russian soup made from beet juice. Beets are easy to find in the grocery store, or you can grow your own if you have the space in your garden. Most varieties are ready to harvest within two months of planting. Seeds can be started in the spring and re-seeded throughout the summer for continuous crops. If you are looking for a tasty way to include more nutrients to your diet, look no further than the lowly beet.